Leverburgh RNLI are to receive a new Shannon Class Lifeboat to replace the current Mersey Class vessel RNLB The Royal Thames. While the Royal Thames has served Leverburgh and her previous stations well, the boat is reaching the end of its working life. The Shannon is the latest class of all-weather lifeboat to join the RNLI fleet. It is the first modern all-weather lifeboat to be propelled by waterjets instead of traditional propellers, making her the RNLI’s most agile and manoeuvrable all-weather lifeboat yet – even in the shallowest of waters. These features make the Shannon particularly suitable for serving the often-challenging Sound of Harris, and beyond. The new Lifeboat is also capable of reaching speeds up to 25 kts, which will mean that volunteer crew can reach casualties, in a shorter space of time. Leverburgh’s new Shannon is currently being built, “in-house” by the RNLI in Poole. Various sections of the boat are in the process of being fitted out by RNLI engineers. The current timetable for the completion and delivery of the Lifeboat will see her commencing sea trials early in 2018. Shannon-specific crew training will take place during the month of March, and it is hoped that the Lifeboat will make its way north and arrive in Leverburgh around Saturday 21st April. It is anticipated that the boat will enter service during the first week in May. The current Lifeboat, RNLB The Royal Thames, will stay in Leverburgh while crew familiarise themselves with the new Shannon, to ensure there is cover at all times. A naming ceremony for the new Shannon will be held sometime during the summer of 2018. Leverburgh RNLI’s Honorary President, Hamish Taylor, said, on behalf of the station: “Over the five and a half years of its service, and with over 80 service calls already carried out, Leverburgh Lifeboat Station, its operating systems and crew have steadily matured in skills and experience, so the imminent arrival of the new boat is a natural development which will significantly enhance the effectiveness of the station. 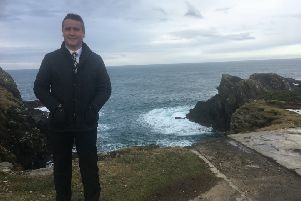 “Throughout this time also, the communities of Harris and North Uist have taken the Station to heart and have been consistently and practically supportive. “Without such support the station would be a lonely and isolated one, so we extend our heartfelt thanks to these wide communities which the station seeks to serve.